This is to give notice that the ordinance of the most honourable Parliament concerning superstitious observances is to be strictly enforced, and whereas Saturday next is the 25th day of December, and all persons whatsoever in the city of Canterbury are to take heed and remember that Christmas days and all other superstitious festivals are utterly abolished, wherefore all ministers and churchwardens and others are warned that there will be no prayers or sermons in the church on the said 25th December. That’s not all. Hanging “superstitious herbs” from doors, such as rosemary, holly and bay was strictly forbidden as were “plum-pottage” and “nativity pies.” In sum, the people of Canterbury weren’t allowed by their newly victorious puritan rulers to celebrate Christmas and they understandably rioted. But why the animus against the Feast? Because for puritans like Bridges, Christmas and its attendant merrymaking was an unbiblical, superstitious holdover from paganism and its idolatrous cousin, the Church of Rome. All this to say nothing of it being a sinful incitement to “lewd wantonness,” such as dancing, feasting and drinking. Irony aside, it was clear to the hardline protestant victors of England’s civil war that Christ had nothing whatsoever to do with Christmas. The Feast of the Nativity was for them at best an immoral Bacchanalia, at worst a blasphemous abomination and so they abolished it, along with Easter and Whitsun (Pentecost). Fortunately, the people of the realm thought otherwise, welcoming Christmas back along with the monarchy in 1660. Fast forward to today and the drive to remove Christ from Christmas is seemingly alive and well, if in a different, secularist guise. You won’t find “Merry Christmas!” printed on the steaming cup of your festive Starbucks gingerbread and spice latte, and chances are your local high school won’t be displaying a Nativity scene either. Likewise, up until this year, the lucky recipients of a White House Christmas card were greeted with a cheerfully euphemistic “Happy Holidays!” A not so coded expression for No Christ in Christmas. This shouldn’t surprise us, secularists who don’t believe in the divinity of Christ are hardly likely to promote Christianity at all, much less a Christian Christmas. By all means “celebrate the season” but don’t bring Christ into it. In fact, drive Him as far away as possible from the public square and mind. Is there a link or causal connection between the puritanism that provoked Canterbury’s Plum Pudding Riots and today’s “War on Christmas”? Some argue that there is; that a denial of the Church’s incarnational aspect, such as sacraments (outward and visible signs of inward and spiritual grace given to us by Christ) and feast days like Christmas, Easter and Whitsun, leads to atheism. They have a point, without sure and certain outward and visible signs of God’s grace, Christianity soon becomes an affair of mind and emotion and it’s a short step from there to believing the whole business of religion is a made-up product of wishful thinking. With that in mind, it looks as though the two sides of the sacramental equation are erased between the Scylla and Charybdis of yesterday’s puritanism and today’s secularism. The one denies the outward and visible, no Christmas for Canterbury in 1647, while the other denies the inward and spiritual. No divinity in the manger say the Happy Holidayists in 2017. Where does that leave us? With something very much like nothing. Enter the Church of Sweden. Like nature abhorring a vacuum, the Church of Sweden has bravely advanced into the void and created something ex nihil, from nothing, a whole new God. It’s defined in the denomination’s new Handbook, which augments masculine words for the deity with their feminine equivalents. Accordingly, the new Handbook turns the Trinity, Father, Son and Holy Spirit, into this: “God, Holy Trinity, Father and Mother, Son – Sister and Brother, and Spirit – Lifeguard and Inspirator,” which has the hopefully unintended effect of making the Divine Persons into an older hermaphrodite, a younger hermaphrodite and a kind of sexually undefined swimming pool attendant/first responder. Well done. Sweden’s trinitarian theologians have successfully created a whole new thing, transitioning God the Father and God the Son into shemales, while leaving the Holy Spirit possibly asexual, the “A” at the end of LGBTQIA, perhaps. God is not human, so much, then, for the Incarnation, for the enfleshment of the Word as a man. For Jackelen, that apparently didn’t happen and the deficit has been made up by something entirely imaginary. So it seems as though Sweden’s bold act of creativity hasn’t got us much further than puritanism or secularism, at least as far as Christmas is concerned. After all, what’s the point of celebrating the birth of a person who never existed, the Sister-Brother androgyne of Scandinavia. Fortunately, there’s another way. We can say with Christians throughout the ages that the baby in the manger, looked on by Joseph, His Virgin Mother, the Shepherds, the Magi and the Angels, was none other than the only begotten Son of the Father, true God and true man. Now that’s a reason to celebrate, the coming together of God and man, not as a myth or fervid act of Nordic creativity but in reality; the birth of a new creation and the opening act in the great drama of salvation. Gloria in excelsis Deo!, glory to God in the highest, sang the angels at the birth of Christ. May we join their chorus as we joyously celebrate the Incarnation and the Nativity of our Lord and Savior and with that, have a very merry Christmas. Fr. 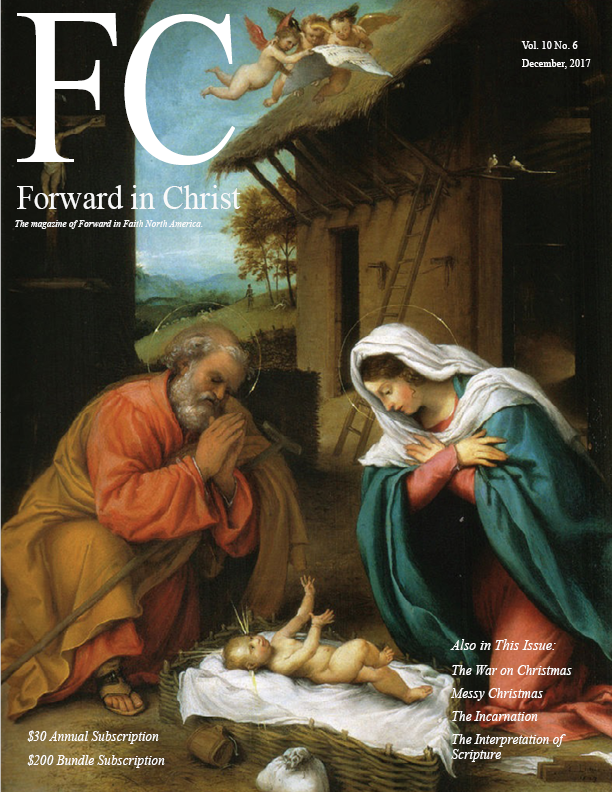 Michael Heidt is Editor of Forward in Christ and a priest in the Diocese of Fort Worth.